This is really an amazing book! I accidentally bought it months ago when it was still a new release and rather than return it, I kept it even though I’m not even fond of hard cover books anymore. It sat on my tbr shelf – and sat – and sat. I just wasn’t all that keen about reading about how bad Steve Jobs was right after his death. So this past week I found myself between books and started in on ye olde tbr pile. I finished Women’s Diaries which was pretty good and then a current interest with some literary criticism on Doctor Zhivago. Then I cracked the Isaacson book thinking I’d read a couple chapters and put it away. I was almost immediately sucked into a well written, hugely informative narrative. About 200 pages later I came up for air. The story is good and Isaacson does very, very well with it. It’s quite even-handed imo, Jobs gets a whole lot of blame – but he’s never “trashed” and he’s also given due credit. 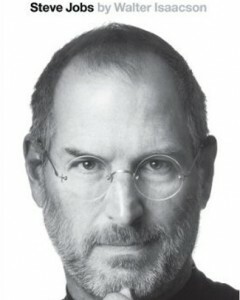 I knew a fair amount about Jobs and his childhood – to the set-up of Apple. I know and truly love my Mac and other devices (I’ve been a fan since 1996). I’d read a bit about his behavior and antics and I also knew some about his family life – his daughter and natural parents, his wife. But the best parts have been the enormous amount of stuff I didn’t know – how much Gates and Jobs communicated, how bad Jobs was, how good Jobs was, how he finally got kicked out of Apple, his girlfriends. I knew the bare outlines – this book contains the substance. So now, and this is before I’m even really finished with the Jobs book, I want a similar book about Bill Gates or more books by Isaacson. It’s that good. A major theme seems to be that Jobs’ creativity worked at the intersection of aesthetics and technology along with the demand for end-to-end control. This is underscored many times in the book – from his refusal to shop his OS around to his involvement in every aspect of the developmental process.